Chores are one of those things that I am improving on slowly over time. As you may know, we did some chore charts about a year ago. They worked really well and the kids loved putting stickers up. 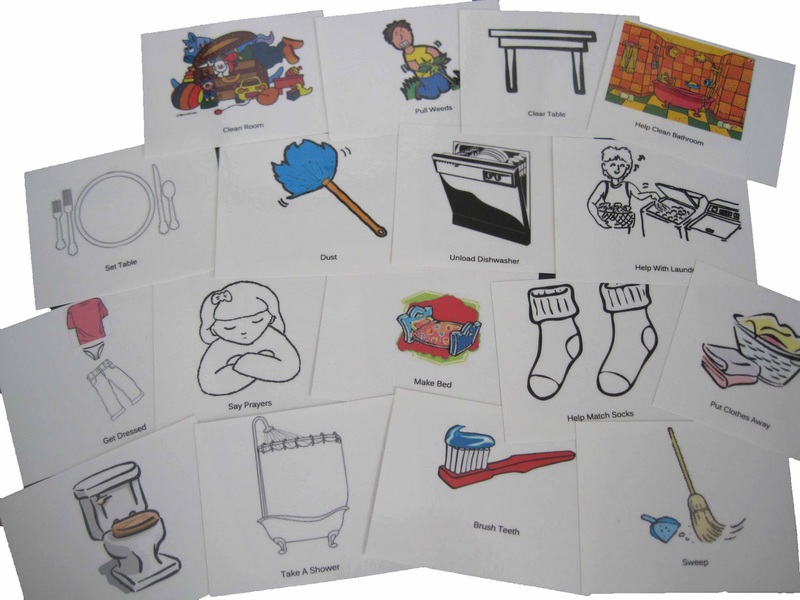 But I also wanted to try out chore cards as described in On Becoming Preschoolwise starting on page182. What are the perks of chore cards? One perk is that when the child uses the chore cards, there is no need for mom (that’s me) to stand over the child making sure it is getting done. You give your child the cards and walk away. This also lets the child develop self-discipline and feel a sense of trust from you. You trust him to get things done. You can also add to and take from the cards as needed. I also liked that I wasn’t constantly printing new papers off. Now, it doesn’t have to be one way or the other, and in fact, the Parenting Breakthrough talks about the benefits of mixing it up every so often. It keeps things interesting 🙂 So you can do chore cards and charts…along with many other things. We have chosen to do chore cards for morning chores. We keep the cards in the child’s drawer in the bathroom. There are cards there that must be done for morning routine. Go potty. Shower. Get dressed (yes, I was surprised to discover children need to be told to get dressed. And go potty for that matter 🙂 ). Brush teeth. Make bed. Say morning prayers. I have also created other cards like dust, help with laundry, help clean the bathroom, pull weeds, etc. for daily chores. I rarely use those as of right now, but I have them if I want them. These are Kaitlyn’s. I made Brayden’s well over 6 months ago and used contact paper to “laminate” the cards. It worked fine, but my opinion is that the lamination works better and it was a TON easier for me. I just couldn’t bring myself to put those cards in contact paper again and work bubbles out and such. I have been really happy with the chore cards. The kids are excited to use them and it helps them remember the things they need to get done without any nagging at all from me. I will upload the chore card files to the Chronicles Google Group for anyone interested in using what I have already made. They are titled “index cards” and there is a set for a girl and a set for a boy (so one file is called “index cards girl”).